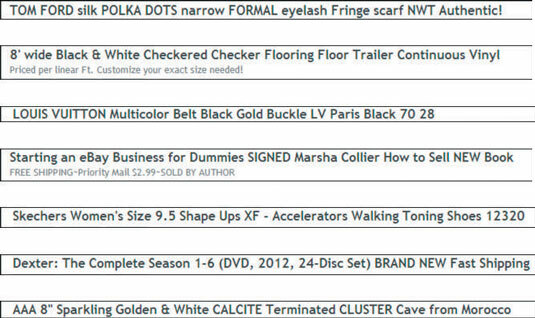 The most valuable onscreen real estate on eBay is the 80-character title of your item. The majority of buyers do title searches, and that’s where your item must come up to be seen! So the onus is on you to give the most essential information right away to grab the eye of the reader who’s just browsing. Be clear and informative enough to get noticed by eBay’s search engine. If the item is rare or hard to find, mention that. Mention the item’s condition and if it’s new. Mention the item’s special qualities, such as its style, model, or edition. Avoid jargon or unusual characters, such as $, hyphens, and L@@K (or WOW), because they just clutter up the title — buyers rarely search for them. There’s a science to figuring out the value of a collectible (called grading). Do your homework before you assign a grade to your item. A secret place to find accurate keywords that users search for on eBay is in eBay’s fairly hidden eBay Labs tool. 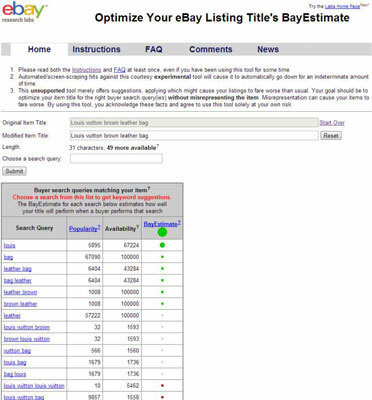 Type in some basic keywords for your item and the eBay Labs tool will let you know what keywords are the most popular for your item. Imagine going to a supermarket and asking where you can find the stringy stuff that you boil instead of asking where the spaghetti is. You might end up with mung bean sprouts — delicious to some, but hardly what you had in mind. That’s why you should check and recheck your spelling. Savvy buyers use the eBay search engine to find merchandise; if the name of your item is spelled wrong, the search engine may not find it. Poor spelling and incomprehensible grammar in descriptions also reflect badly on you. If you’re in competition with another seller, the buyer is likelier to trust the seller hoo nose gud speling. If you’ve finished writing your item title and you have spaces left over, please fight the urge to dress the title up with lots of exclamation points and asterisks. No matter how gung-ho you are about your item, the eBay search engine may overlook your item if the title is encrusted with meaningless **** and !!!! symbols. Another distracting habit is overdoing capital letters. To buyers, seeing everything in caps is LIKE SEEING A HYSTERICAL SALESPERSON SCREAMING AT THEM TO BUY NOW! All that is considered shouting, which is rude and tough on the eyes. Use capitalization SPARINGLY, and ONLY to finesse a particular point or feature. A useful feature on eBay is the availability of subtitles. eBay allows you to buy an additional 55 characters as a subtitle, which will appear under your item title in a list formatted search. The fee for this extra promotion is $0.50 ($1.50 for 30 days), and in a few circumstances, it is definitely worth your while. Any text that you input will really make your item stand out in the crowd — but (you knew there would be a but, didn’t you?) these additional 55 characters won’t come up in a title search. So if you have all those words in your description, the words will be found either way with a title-and-description search.